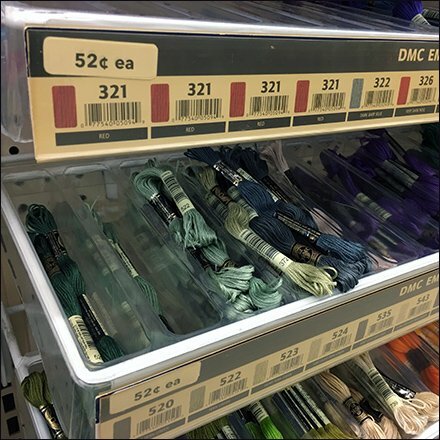 Given the huge range of merchandise offered, special attention was paid to this Embroidery Floss Tray Rack Labeling Solution. DMC Embroidery decrypts its offerings by presenting Floss Color, Floss Textures, Item Number, Scan Code, and a verbal descriptor. Shopping by color, textures, number (for a sense of sequence) and name aid the consumer. The item number and scan code are most useful in maintaining the display, re-ordering and restocking. So for a custom outfitting answer like this Embroidery Floss Tray Rack Labeling Solution, consider a parallel Embroidery Floss Tray Rack Labeling solution.